Academy of Fine Arts is set to host a solo exhibition of artist Asutosh Pramanik’s most recent works at its West gallery, beginning April 16. The week-long exhibition will showcase the neo-expressionist works of the self-taught artist who happens to be a doctor by profession and currently teaches Anatomy at Murshidabad Medical College. 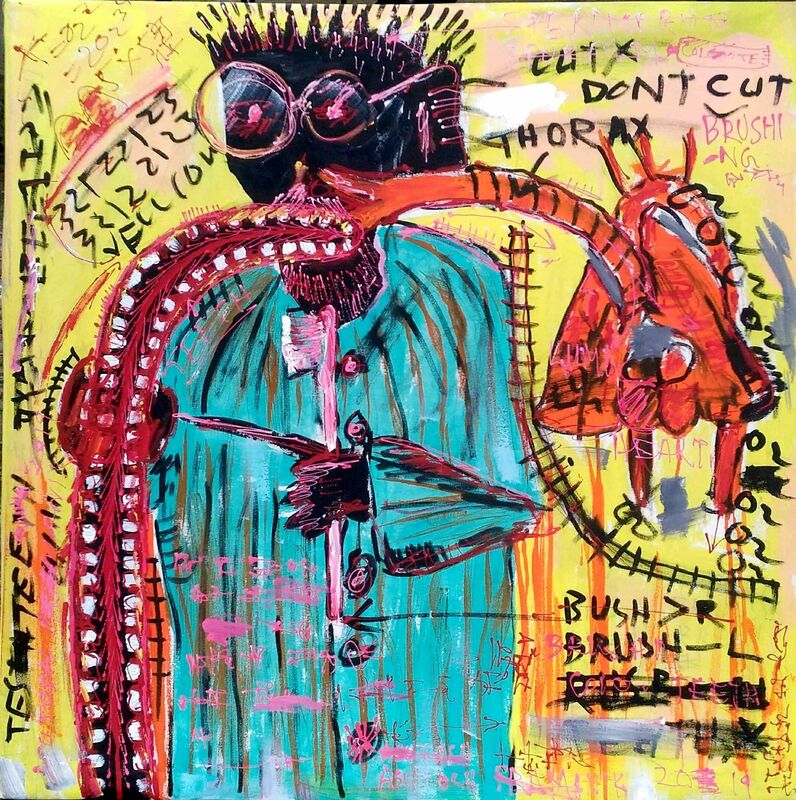 Most of his works are inspired by American artist Jean-Michel Basquiat and aims to arrive at an Indianised style of Basquiat’s works. 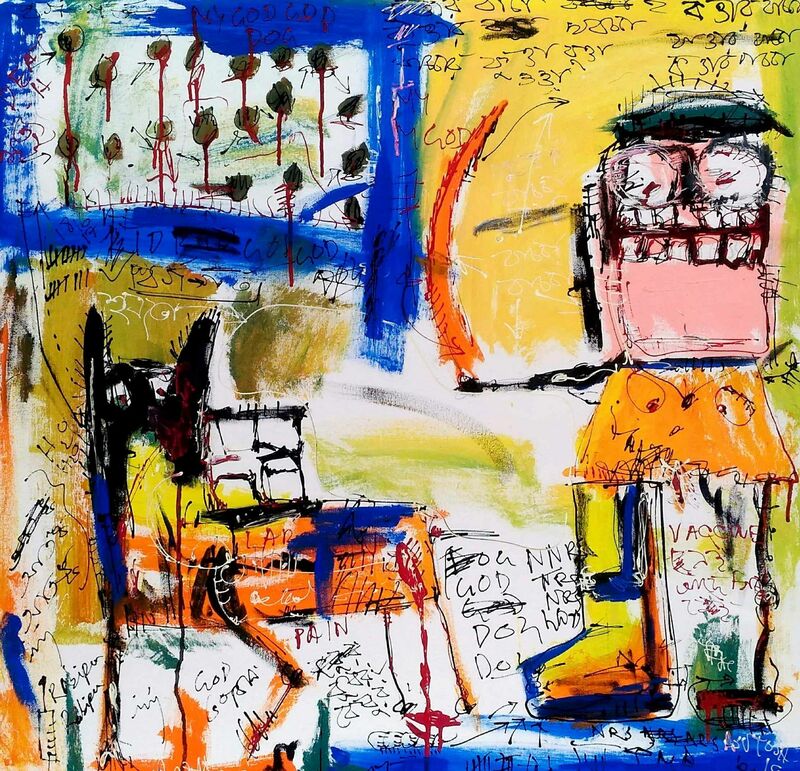 He uses acrylic on canvas, to emote with vibrant colours, the day-to-day activities, incidents and situations that he experiences around himself. 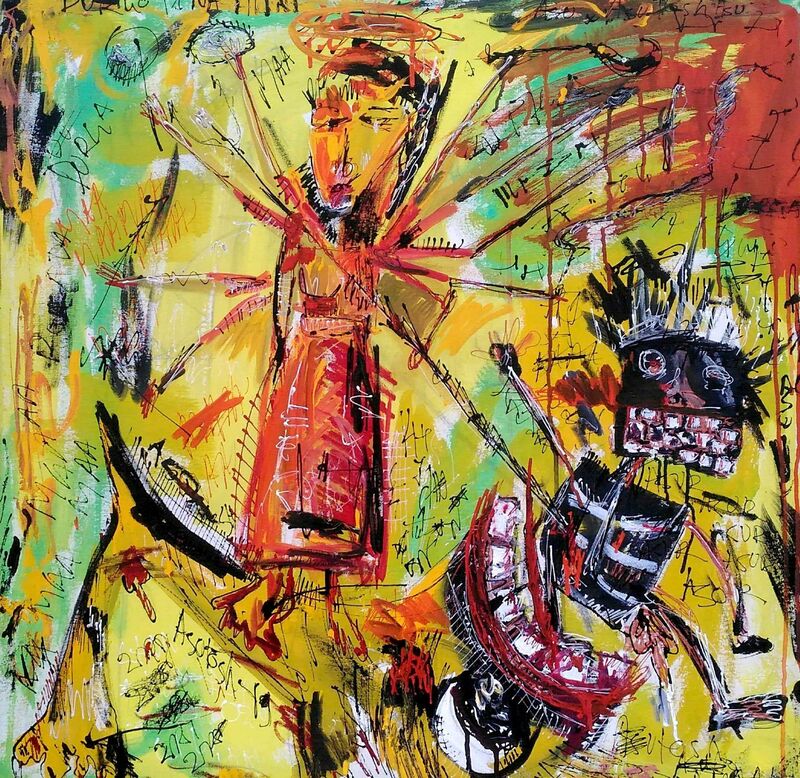 With the characteristic crude and unsophisticated style of the neo-expressionists, the different stories he perceives around himself, at different moments, translates into absurd complexities on his canvas. But there are small notations too, written portions in Bengali or English, for those who want to read and decipher the ‘everyday restlessness’ that his works convey. “I find that neo-expressionist style is the best way to convey whatever is going around us at the moment. Whether it is the murder of several puppies at NRS Medical College depicted in the work called the dogs or the daily act of brushing teeth, in the brush. Realistic works cannot convey it,” says Asutosh Pramanik, the artist. 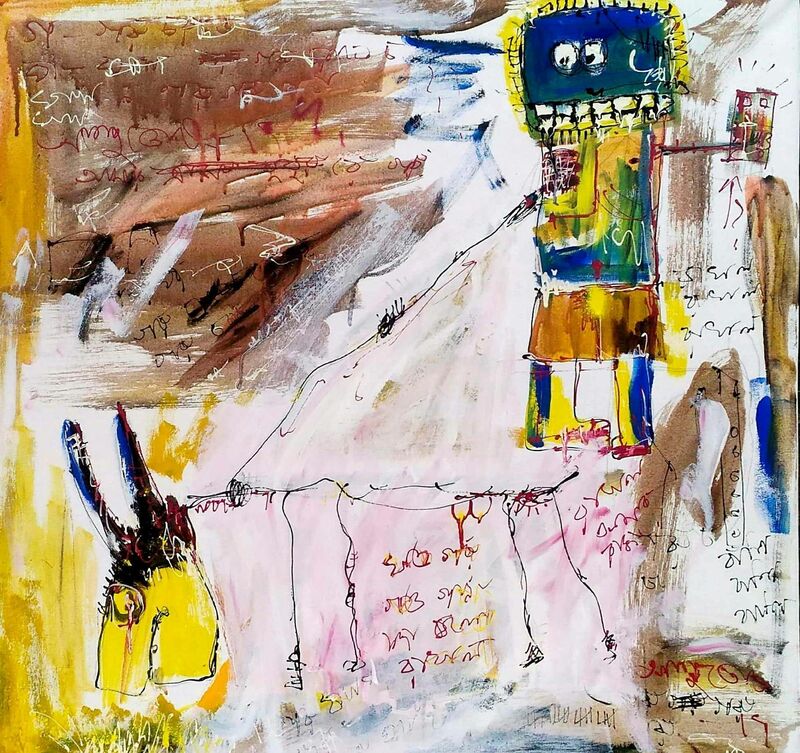 One can notice a deft use of colour in Asutosh’s works- whether it is a red background and a pale yellow cross in the yellow cross or the balance of fresh green and cool blue in the surrealistic work called the goat-master, which is inspired from Salvador Dali’s The Great Masturbator. “I don’t always plan which colours to put in work. Every work comes into being with its own demands of colour and composition. But I do prefer working in daylight,” reveals the artist and the doctor. There are others like the couple, balance, Jatayu Badh, Durga and Ganesh. While the first one shows a normal couple, there are small scientific motifs drawn and written all over the canvas with an abundance of yellow. The work balance shows a man trying to negotiate personal and professional responsibilities. The brush, on the other hand, has a horrific image of a human figure who is brushing teeth, but all his organs seem to be coming out, including his teeth, which are also falling out. The moral- brushing teeth can cleanse the mouth but how does one cleanse oneself, inside out?- especially when it is the soul that needs cleansing. The figure with a black face and turquoise blue clothing might be a horror-comic on the medical profession itself, with its obsession with sanitisation and cleanliness. Solo exhibition of Dr Asutosh Pramanik’s works to open at the Academy of Fine Arts, West Gallery on April 16, 3 pm.